WOW this is a great deal on this tablet. I received one for review a few months ago at a travel blogger conference and I LOVE mine. I mean really, really love it a lot. Well worth the money. You are able to create a profile for the adults in the house so they can use the tablet to. The child’s profile can have limitation on it such as internet usage and you can make it so they have to read x amount of time before the internet unlocks each day. Don’t worry about the bill—The Kids Edition includes a year of Amazon FreeTime Unlimited so kids get unlimited access to 5,000 books, movies, TV shows, educational apps, and games—at no additional cost. Kid-Proof Case—Durable, lightweight case to protect against drops and bumps caused by kids at play. 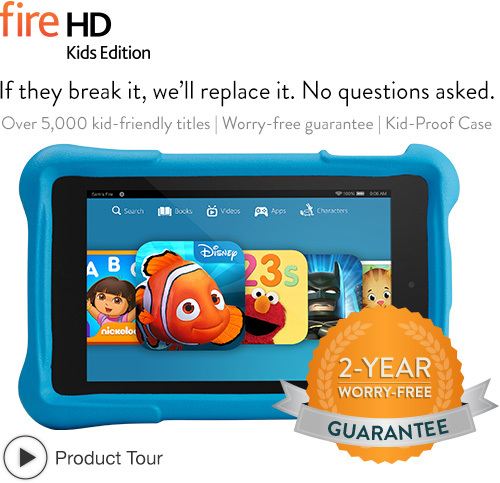 Purchase Fire HD 7 Kids Edition, 7″ HD Display, Wi-Fi, 8 GB, Blue Kid-Proof Case for $159, that’s a $30 savings! The kids tablet comes with a case that makes the tabled indestructible. You can throw it in the air, into a wall, drop it, do anything to it and it won’t break. But if it does break Amazon will replace it no questions asked! That part of probably my favorite part of the warrant. In fact when Amazon reps were at the blogger meeting they were tossing the tablets into the air letting them hit the ground, into walls, and across the room. The tablets did not break! Purchase the smaller tablet version Fire HD 6 Kids Edition, 6″ HD Display, Wi-Fi, 8 GB, Pink Kid-Proof Case for $119.